This recording involves a variable supergroup of sorts. Guitarist Han-Earl Park has been improvising throughout the U.S. and Europe, working with a who’s who of creative music. Reedist Catherine Sikora recently relocated from Ireland to New York, and is playing in various free improv ensembles. Guitarist Nick Didkovsky, appearing on two tracks, is best known as the mastermind behind Doctor Nerve, and more recently has been playing extreme metal. Josh Sinton, appearing on the three tracks not featuring Didkovsky, specializes in playing the baritone saxophone and bass clarinet, and has teamed up with notable figures of the Chicago and New York creative music scenes. A pair of trios rather than a true quartet, putting this unlikely lineup together was almost as brilliant as the recording they have produced. 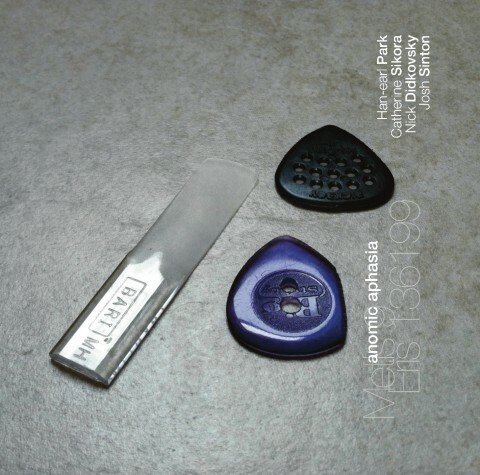 The Didkovsky-Park-Sikora tracks were recorded in June of 2013 at Brooklyn’s Douglass Street Music Collective, while the Park-Sikora-Sinton tracks came from an October 2013 date at New York’s Harvestworks. As a two-guitar, one-reed or a one-guitar, two-reed attack, it is often impossible to determine who is responsible for the sounds found herein. Park and Didkovsky lay down high-speed harmonics, loose chording, and rattle their fretwork, while Sikora and Sinton provide both background drones and foreground voices. “Free” is a barely sufficient to describe this approach, as the trios explore various angular constructs and effects. The vocabulary of sounds here is as broad as it is unconventional. Park and/or Didkovsky might strum or pick a string or two, then spend time rubbing it with their fingertips. Sikora and/or Sinton might blast percussively between more discernable notes. While an occasional interlocking harmony might emerge from all of this innovation, it is quickly shattered by unexpected Möbius twists. Anomic aphasia is a disorder in which a patient exhibits difficulty recalling words, names, and numbers. It is accordingly ironic that it is difficult finding the expressive language to describe this recording. An exercise in texture as much as it is in melody, Park, Sikora, Didkovsky, and Sinton don’t just break molds here – they disintegrate anything that resembles the ordinary with authority and prejudice.